On October 19, Apple started accepting iPhone XR pre-orders with the new phones being available on October 26. As of this writing Apple is not selling the SIM-Free unlocked model iPhone XR. However, if you buy one of the carrier models and choose to pay for full price and choose the Activate later model you can still buy an unlocked phone with without having a carrier account. See my most recent video. Since iPhone XR hasn’t shipped yet and I haven’t bought one, I cannot 100% say this will work if you want to use the phone with another carrier. However, this is what I would do if I decide to buy one. Apple has a 14 day return policy so if you have a problem using the phone with you carrier you can return it to Apple. In prevoius years I bought full price AT&T, T-Mobile, and Verizon iPhone models from Apple and never had a problem using them with other carriers. This point is often debated in Apple’s online support forum with people both saying their phone was locked or unlocked. On September 12, 2018 Apple announced three new iPhone models, the iPhone Xs, Xs Max, and iPhone Xr. Today I want to take figured the model numbers for the SIM-free verisons and when these phone will be available. If you are interested in using the latest iPhone with prepaid wireless, you best option is to buy the SIM-free version from Apple. The SIM-free iPhone Xs, Xs Max, and Xr are compatible with AT&T, Verizon, T-Mobile, and Sprint. They are unlocked and perfect for use with the prepaid wireless carrier of your choice. 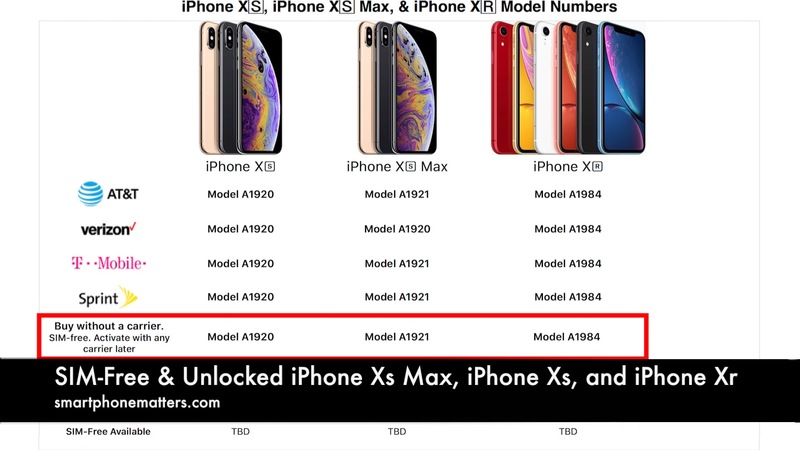 Based on the information from apple.com, the SIM-free iPhone Xs is Model A1920. The SIM-Free iPhone Xs Max is Model A1921, and the SIM-free iPhone Xr is the A1984. For 2018, there is only one model for the iPhone Xs, Xs Max, and Xr. This means that the same phone is compatible with all four carriers. Be advised though, its possible if you buy a full price carrier iPhone directly from Apple or a carrier it could be locked. The SIM-free model is guaranteed to be unlocked. The iPhone Xs and iPhone Xs Max, have a preorder date of September 14 and are available September 21. The iPhone Xr will be available for preorder on October 19 and available on October 23. However we do not know if you will be able to preorder the SIM-free models on these dates nor when they will be available. Apple typically waits weeks or in some cases months before making the SIM-free models available. If you look on apple.com they list the SIM-free iPhone Xs models but not for the iPhone Xr. Even though the SIM-free option is listed for the Xs models it does not guarantee you’ll be able to order on. They did the same for the iPhone X last year but it wasn’t available for order initially. If you decide to buy a AT&T, Verizon, T-Mobile, or Sprint version of the phone, you may need access to an account for the carrier. Last year with the iPhone X you had to choose the activation option when you ordered online. A few weeks later, you could be the carrier version and choose to activate the phone later. Are you interested in the SIM-free iPhone Xs or iPhone Xr, leave a comment below and share. If i am going to buy the iphone xr in a full price in the U.S. is this will be working fine also in the Philippines using a Philippine sim card? (Globe and Smart). Because I don’t know if it is working like a sim free model that can be use globally, since they do not have the sim free version. Because I am confuse if the iphone xr will be working only to four major network carriers in the U.S. or it can be use globally like a sim free. Because as stated on the carrier compatibility this new iphone will be working on four major network carriers in the U.S. which is the Verizon, At&t, T mobile and Sprint. Please advise. Thanks. I can confirm that the full retail price ones are unlocked! I got one yesterday from the Apple Store in NY and am using it now in Germany with my german SIM Card (Telefoónica o2). 3G and LTE working fine! I got a white Xr in 128GB with Verizon SIM Card. Thanks for sharing that. Enjoy the XR! What is the cost for the sim free phone? Can anyone tell me when the sim free version of Xr will come? I’m from a different country but buying from US so. We don’t know when or even if it will be available. I suspect it will be but maybe not at launch.